We offer a huge variety of compostable liners and sacks – These range in size from ones suitable for small kitchen compost caddies, through to kerbside caddies, kitchen bins and right up to wheelie bins. What’s more, we stock brands from a selection of manufacturers, including paper liners. Using a compostable liner is very convenient, as not only does it help keep your caddy or bin clean, but also odour-free. Your food waste can be easily stored until your next food waste collection day or put out on your compost heap. Compostable liners need to be stored in cool, dark, dry conditions to keep them at their best - A kitchen cupboard or drawer is ideal. Under these conditions, you would expect them to last approximately 18 months before they begin to degrade. 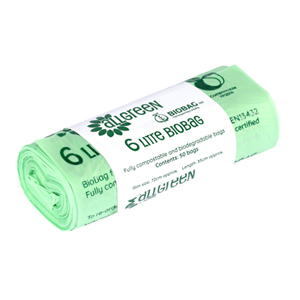 The majority of our compostable liners are produced from corn starch, so are very environmentally friendly – These liners help keep your kitchen caddy or bin clean and odour free. All our liners are fully certified as Compostable and Biodegradable to the European standard; EN13432. They’re all printed with the internationally recognised “Seedling Logo” which identifies them as compostable and environmentally friendly. Compostable liners will break down harmlessly within about 45 days in commercial composting plants. If you’re using them on a home compost heap they may take longer, depending on how well your compost heap is working. However, either way, using compostable material ensures harmful plastic does not contaminate the environment for years to come. To shop our compostable liners, click here.